Ian Fleming wrote the novel “Chitty Chitty Bang Bang” in 1964 and it was adapted and released in 1968 as a film with music and lyrics by the famous Sherman brothers, gaining immediate success. Much later – 2002 in fact – Chitty became a stage musical, when it ran in the London Palladium until 2005. Broadway took over in 2005 and tours of UK, Australia and Singapore have followed. Last year a decision was made to release the show to selected amateur groups and BDG were lucky enough to be chosen to present the All Ireland Premier in the Riverside Theatre which belongs to the University of Ulster. The curtain opened to the showing of old Grand Prix footage to the company on a large screen at the back of the stage. Three wing flats at each side of the stage featured subtle paintings of cogs, wheels and nuts. With double doors at the back stage left, this design worked well as background for all scenes with animated projections and lighting. Brightly dressed for the Funfair and dark for the Sewers – props were suitable although ‘inventions’ for Breakfast and Sweet making machines were a little disappointing and unimaginative– later on the Hair cutting invention was better. Grandpa’s sentry box flying across the front of the stage was a lovely touch!! Costumes from Utopia were colourful and authentic. Although a large chorus opened with enthusiasm, early scenes created a rather slow start. However, with the introduction of the main characters – Caractacus Potts the inventor and his children Jeremy & Jemima and Grandpa Potts it built up. The relationship between the family members was strong and believable. I saw John Mullan and Rihanna McGraw playing the children (Connor McColgan and Lauren Bond took those roles at alternate performances and were equally credible I’m sure). They all portrayed a typical family unit with Richard Mairs as Grandpa, as he repeatedly told his old army stories and was shouted down by his grandchildren! Richard perfectly captured the character of the old soldier – one of his best roles to date, I think. The comedy duo – Boris & Goran – were ably played by Stevie Black and David McDowell. They brought a light touch to the sometimes annoying roles and extracted many a titter from the audience! 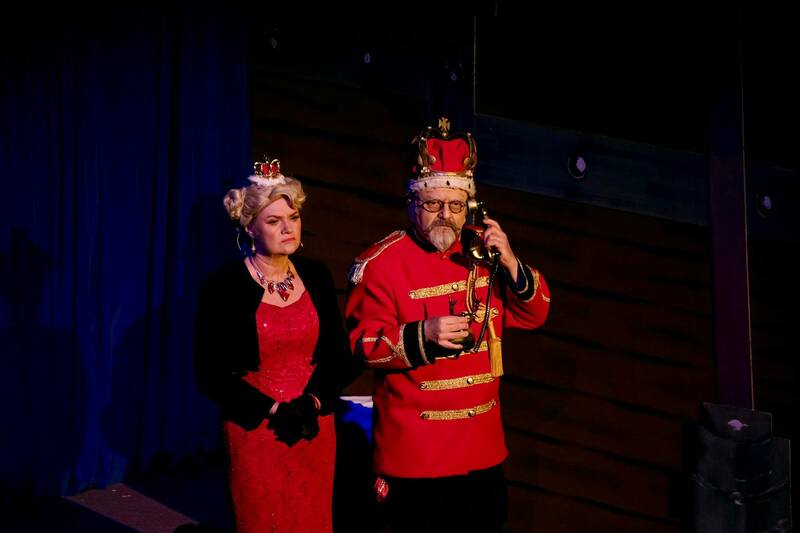 Paul Sleet and Maxine McAleenon took the roles of Baron & Baroness Bombast – the child hating rulers of the kingdom of Vulgaria. They made a comedically unpleasant pair and their duet “Chu-Chi face” was well performed although I think Maxine had a cold as her voice was not as strong as usual (I know the bad notes were intentional!!) Patrick Connor was reminiscent of Benny Hill as the Toymaker (not a bad act to base his performance on! 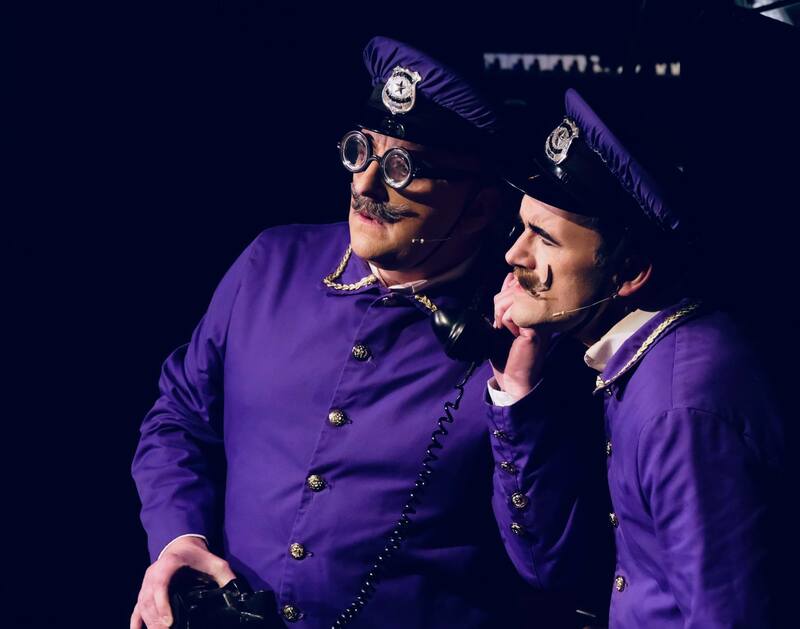 ), while Ewan Williams, Tom Waddell, Chloe Freeman, Jim Everett, Olive Hemphill and the Inventors filled their many smaller roles with aplomb as well as playing their part in the Ensemble. The dancers, ensemble and junior chorus (Red team at the performance I attended) were all very well-schooled and sang well too. The Sewer scene and Castle battle were particularly effective, while dancing in the Sweet factory and Bombi Samba was very well executed as was the energy shown in “Me Ol’ Bamboo” &“The Roses of Success”. If there were a few girls dancing as men they were well disguised! In his short but sweet appearance as the Childcatcher, Alan McClarty caught everyone’s attention and scared the daylights out of quite a few!! With fantastic make-up and prosthetic nose, he danced and pranced with sinister whisper as he searched for children – proving that there is no such thing as a ‘small role’. 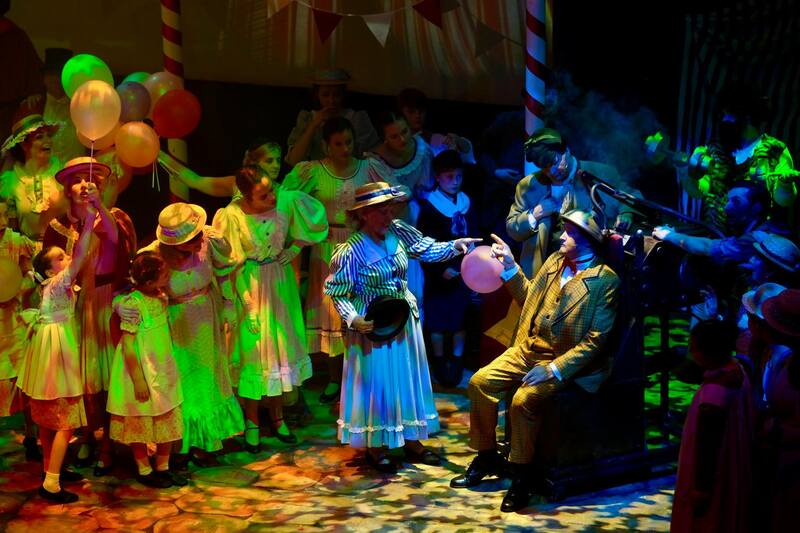 Together with Laura Fisher looking as ‘truly scrumptious’ as her namesake, and Matt Suddaby as the lovable eccentric who believed in his inventions and adored his children, Chitty Chitty Bang Bang could not fail to capture the hearts of the audience. Both sang very well individually and together, with good chemistry between them. I was also impressed with Matt’s athleticism throughout his performance. MD Eric and Andrew did a great job on teaching the music and his excellent 14 piece orchestra never overpowered the singers. Sound was very well balanced. Sharon and Laura choreographed a large number of pieces for a huge cast – all were well rehearsed and precise as was the sheer movement of people around the stage throughout the show. Director Brian’s heart was truly in this show and it was obvious. His lighting was, as usual, innovative although sometimes I wish it was a little less dramatic and a little brighter if the scene allows! The sewer scene was splendidly atmospheric! I occasionally felt that things happened too quickly to make an impact – in the sweet factory I would have liked to hear dogs in the distance, getting louder and louder before the sudden black-out, and I would have liked the Caractacus to appear out of a box at the birthday party and the Child catcher be captured by the children in a net before being carried off. I noticed the script having the toymaker say “Draw the curtains” in his shop – and there weren’t any….. but I am nit picking because overall Brian directed an excellent show. The sheer spectacle of the car driving on the stage and then rising up and tilting as if flying (the smoke and projection successfully added to that illusion) was what the audience came to see and all the rest was a bonus! !